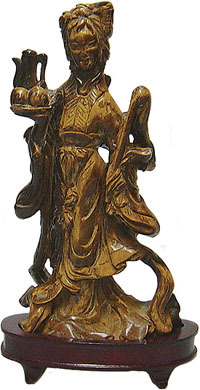 Item #GS-358: 4"x3.25" tall dark Brown with Gold eye Tiger's Eye Beauty with Flute and Bird; Mounted on 1" tall wood stand. Item #104A: 3"x1.25" tall dark Brown with Gold eye Tiger's Eye Creature. Mounted on .875" tall carved wood stand. 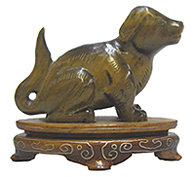 Item #GS-2130: .75"x2"x1.25" tall Gold Tiger's Eye Dog mounted on .5" tall carved wood stand. Item #GS-457: 3.5"x4.5"x2.5" tall dark brown Tiger's Eye Frog with gold eye and coin in mouth. Item #GS-365: 2.75"x7.5"x4.375" tall dark Brown with Gold eye Tiger's Eye Horse. 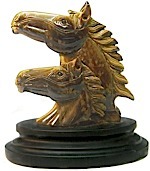 Item #2005-2589: 1"x3.75"x3.75" tall dark Brown with Gold eye Tiger's Eye Horse Heads. Mounted on 1" tall Black Basalt base. 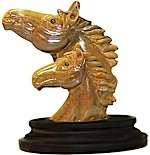 Item #2005-2190: 1.25"x4.25"x4.25" tall dark Brown with Gold eye Tiger's Eye Horse Heads. Mounted on 1" tall Black Basalt base. Item #GS-367: 4.5"x3.5" tall dark Brown with Gold Tiger's Eye Hoti holding alms bowl. 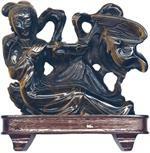 Item #GS-368: 2"x1.625" tall dark Brown with Gold Tiger's Eye Hoti. Item #GS-370: 2.25"x1.5" tall dark Brown with Gold Tiger's Eye Hoti. Item #GS-373: 2"x2" tall dark Brown with Gold Tiger's Eye Hoti. Item #GS-374: 2.25"x1.25" tall dark Brown with Gold Tiger's Eye Hoti. Item #GS-377: 2.5"x2" tall dark Brown with Gold Tiger's Eye Hoti. 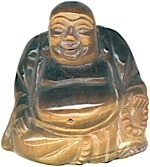 Item #GS-363: Seven approximately 2.5" tall dark Brown with Gold eye Tiger's Eye Chinese gods. Mounted on 11"x4.5" tall carved wood stairs. Item #53: 6 1/2" tall Golden Tiger's Eye Beauty on wooden stand. Item #GS-638: 1 1/8"x2 3/8" tall Golden Tiger's Eye Beauty with vase and flowers; Mounted on 3/8" tall wooden stand. Item #AM-TEF-75: approx. 5" long carved Tiger's Eye Arowana Fish. Various colors.